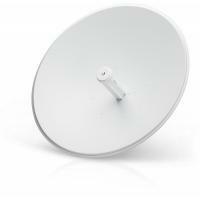 The Ubiquiti PowerBeam PBE-5AC-620 directs RF energy in a tighter beamwidth. With the focus in one direction, the PowerBeam ac blocks or spatially filters out noise, so noise immunity is improved. This feature is especially important in an area crowded with other RF signals of the same or similar frequency. Ubiquiti’s InnerFeedTM technology integrates the radio into the feedhorn of an antenna, so there is no need for a cable. This improves performance because it eliminates cable losses. Featuring high performance and innovative mechanical design, the PowerBeam ac is versatile and cost-effective to deploy.